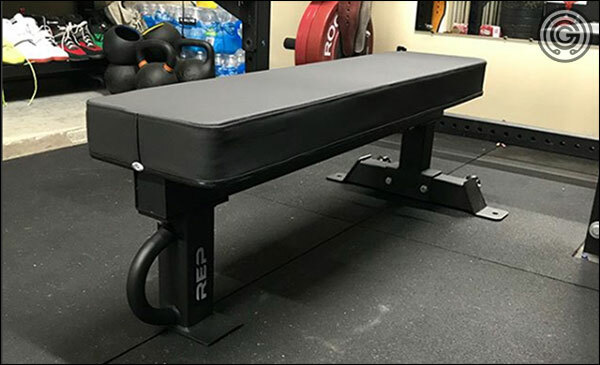 This is a comprehensive review of the new Rep Fitness FB-5000 Competition Flat Bench; a relatively new bench that offers virtually unlimited load capacity on a lightweight, low-profile, foot-drive-friendly frame – and for a very attractive price. The FB-5000 was designed to be used in conjunction with the thick, grippy vinyl pads; pads like the Rogue Competition Pad, the Thompson Fat Pad, and of course Rep’s own included version of these pads. By making the frame shorter, we can install any one of these new 4″ thick pads and still have a bench that is within the normal range for height (around 17-17½” from the floor to the top of pad) rather than being excessively high; like when installed on a standard-height bench frame. Prior to the release of the Rep FB-5000, our only real option for owning one of these beefy, grippy benches was to buy the Rogue Monster Utility Bench with a Thompson for $295 plus shipping. Up until recently we also had to pay an additional $40 to have the Monster frame chopped down to 13″, but today we can actually select the “shorty” option when adding the bench to cart and not have to pay that customization fee, which is nice. Of course, you also had (and still have) the option of installing the Fat Pad onto a standard-height frame like the Rogue Utility Bench if you didn’t mind benching from a 20″ high bench, but I don’t think most people are into that. I’ve tried it myself and it’s pretty awful. In any case, a Rogue Monster frame with either of the Rogue “fat pads” will run you about $300 before shipping, whereas the Rep FB-5000 will run you about $150 before shipping. Now there are pros and cons to each frame, each pad, and each possible combination of the two, but that’s what the review is for; to discuss these things. Note: at the time of this writing, Rep’s wider Gripper pad is still not released, so a little bit of an assumption is made that it will be exactly the same as the Competition-sized pad in terms of the vinyl cover. If that turns out not to be the case I will edit, but I have it on good authority that it will be. 3″x3″, 11-gauge steel frame with thick mounting/connecting plates. Three-foot design doesn’t restrict foot placement. Frame has no noteworthy maximum capacity. Frame is 48″ long and 13″ high without the pad. Included default pad is 48″ long, 4″ thick, and 12″ wide. Total distance from floor to top of pad with default pad is 17″ – within IPF specs. Frame has fixed metal end caps versus the cheap plastic caps that pop out. Retail price of $149 before shipping; imported. The alternative; the Rogue [shorty] Monster Utility Bench; is a great option too. It’s made in the USA, it’s as durable and beefy as it would ever need to be, and of course it can accept any of the same thick pads. However, it is not only much more costly, it’s much heavier and more cumbersome to move around (no wheels or handle), and the massive rubber footings can most definitely get in the way of your foot placement – potentially interfering with drive. As mentioned in the above specifications, the default pad for the Rep FB-5000 is 48″ x 12″, and the distance from the floor to the top of the pad is 17″. These are ideal dimensions for a bench, as all three dimensions are perfect for the majority of lifters (and within IPF specs). 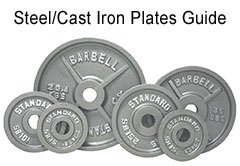 For larger, broader lifters, the 14½”-wide pad is a great alternative to the standard 12″-wide pad. This thicker pad has the same thickness so it’s still 17″ from floor to top of pad, but the pad is 2½” wider than the default pad. This extra width allows a broader lifter to keep his or her shoulders on the pad rather than having them hang over the edge of the pad. The original pad that came with the FB-5000 is gone. This is good because this pad didn’t have the grippy vinyl anyway. RIP first batch pad. Installing the Thompson Fat Pad to the FB-5000 frame is the same as the Competition Pad, only the width is now 14½” rather than 12½”. 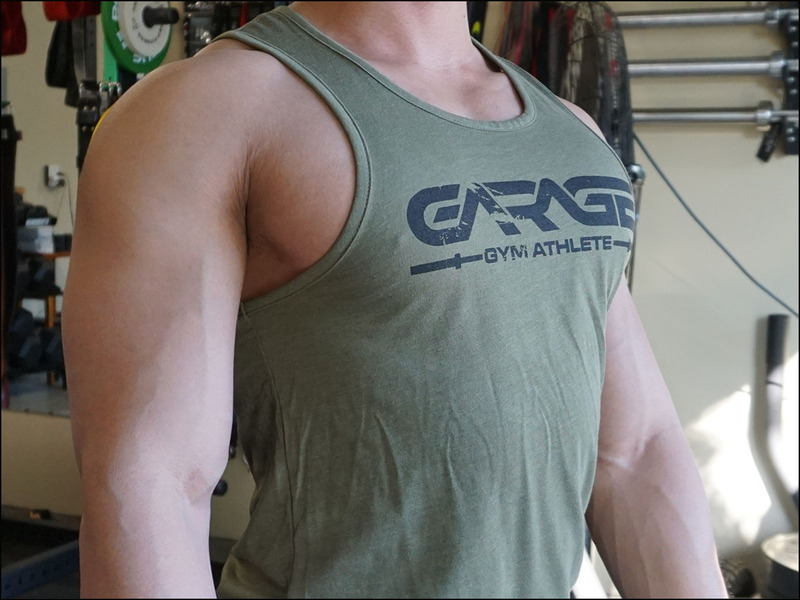 A great many garage gymers already own the Thompson, and have already installed this pad onto their new FB-5000 frames – especially since the wide Rep pad wasn’t even available for the first two batches of FB-5000 frames. 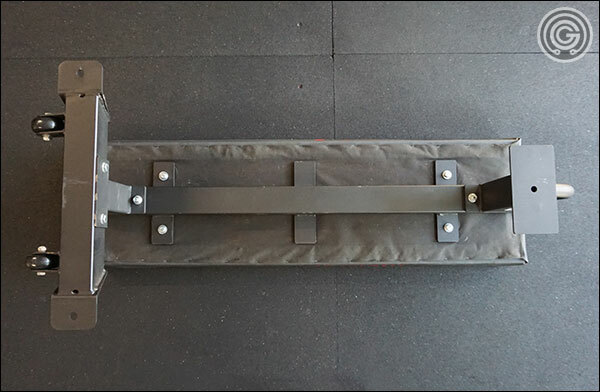 The Thompson Fat Pad is by and far the greatest bench pad on the market, and even at its high $155 price tag I’ve advocated its purchase for a long time. Having said that, Rep did a fantastic good job of creating a solid, dense, and grippy alternative to the expensive Rogue pads. Having a less expensive, comparable alternative is a great thing; especially for those with smaller budgets. The FB-5000 has a three-footed frame design; like a tripod. It has a typical long, horizontal support at the head of the bench, and a single support post at the foot of the bench. This is great design for a bench meant for heavy pressing because it allows any foot position to be taken without having to worry about the bench getting in the way of your feet. This three-footed frame design can also help eliminate rocking issues for those who lift on an uneven foundation. 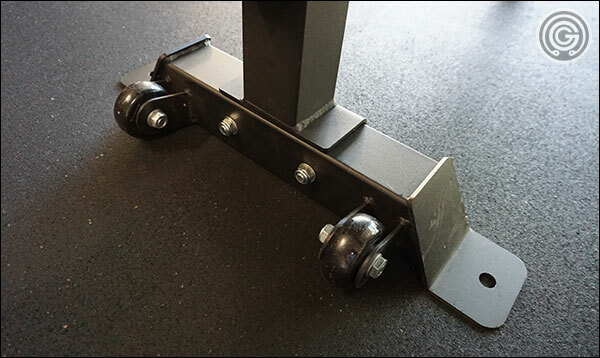 A tripod (the FB-5000) is simply much easier to get into a position of stability than a cube (most other benches), and while this is not a huge problem these days since most gyms are covered in stall mats, it can still come up. Those of you who know that your equipment wobbles around because of your uneven floor will appreciate this design. Finally, the FB-5000 is lighter because of this design. Combine that with wheels & a handle and you have a bench that’s much easier to move around than something like the Monster Utility Bench (which is 80+ lbs with the Thompson Pad). When first released, the Grabber Vinyl cover on the Donnie Thompson Fat Pad blew a lot of folks away – myself included! In addition to the larger surface area of the pad itself, the new textured vinyl actually grabs hold and pins us to the pad; eliminating any and all sliding. The best part is that it will do this regardless of whether we’re bone dry or dripping with sweat. 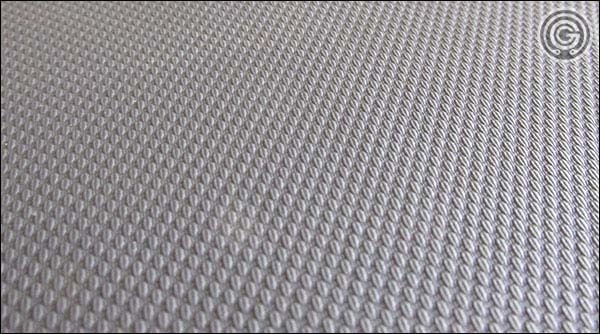 Having a textured vinyl pad like this is next level. Because of how grippy it is, it gives us the option of benching with or without our shirt, and we no longer need to lay down the shirt we just took off, a towel, or one of those non-slip bench mats just to go big on the bench press; again, no matter how sweaty we are. So what about the Rep Gripper Pads? How do they stack up against Thompson’s Grabber vinyl? Turns out that the Rep Fitness Gripper pad is about as comparable to the Rogue ‘Grabber’ pads as you can get. 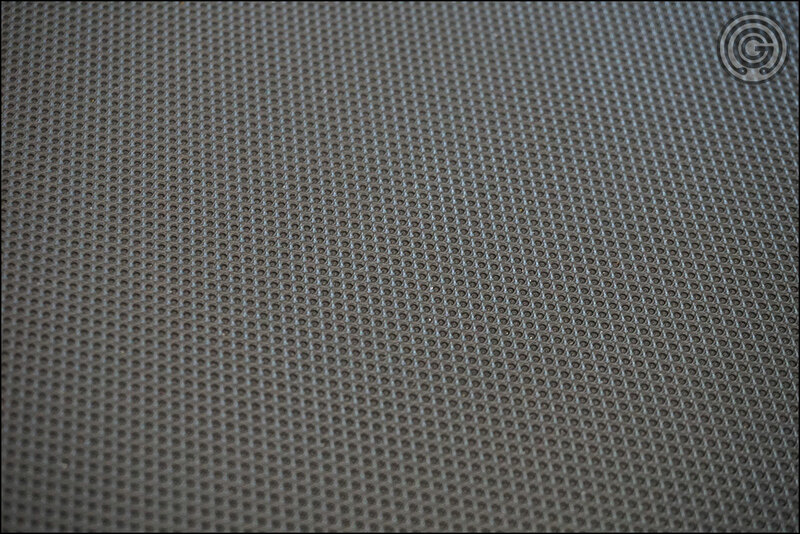 Both manufacturers use a similar three-dimensional texture to achieve their grip, but Rep’s texture is more of an inverted version of the Rogue texture rather than a direct copy. That is to say, Rogue’s textures are raised above the rest of the surface of the vinyl (like tiny water droplets), while Rep’s are below the surface (like say craters). Both use the same actual (or very similar) material from what I can tell. At the end of the day both feel about the same, and both work exceptionally well to keep us in position on the bench. Pad dimensions are great at 12″ x 48″, and the 17″ distance from the floor to top of pad not only allows for good leg drive, but meets IPF specs. 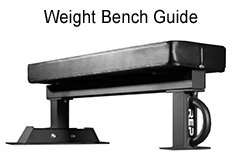 Heavy-duty, 3″x3″ 11-gauge steel frame with even thicker connecting plates makes for a bench with no real max weight limit – at least nowhere near what a human can press. The Rep FB-5000 is cross-compatible with all of Rogue’s bench press pads, including the Thompson Fat Pad and Rogue Competition Pad. It’s also a lighter weight, far less-costly alternative to Monster Utility Bench. A $149 price tag makes the FB-5000 an insane deal. This price includes both the beefy frame and the 12 “x 48”, grippy vinyl bench pad. This price is less than just the pad from Rogue. The grippy vinyl is durable, and actually grippy. The texture (the pattern) of the Rep pad is somewhat different than that of the Rogue/Thompson pads but functionally there’s no difference; six of one and half a dozen of the other. Basic tool ownership (a socket and wrench) allow this bench to be assembled in literally 5-10 minutes; fifteen if you’re taking your time. No cheap, plastic end caps that break and fall out of the steel tubing. The FB-5000 really has no cons. It is feature rich, well-designed, stronger than it needs to be, and ridiculously competitive in terms of pricing. It has sold out almost immediately each time a new batch is released, and it has a 5-star average made up of 30+ reviews and counting. The FB-5000 is a gem of a product. 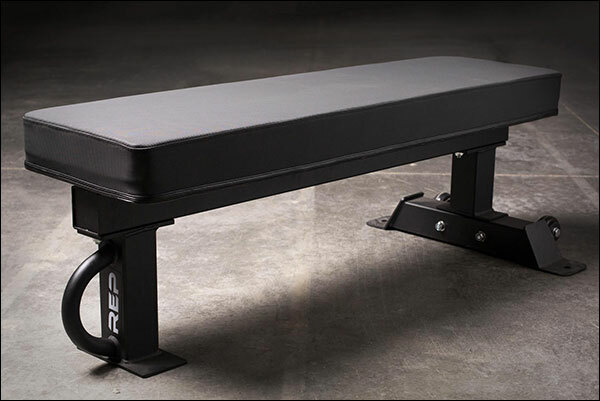 The Rep FB-5000 is a perfect utility bench. 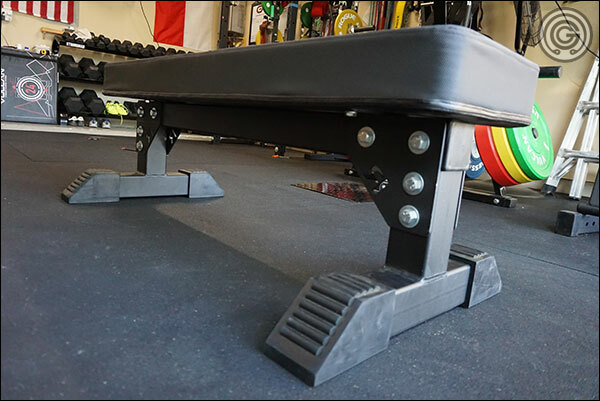 Whether you choose and use one of Rep’s own bench pads with it, or you buy it exclusively for attaching your existing Thompson Fat Pad, I believe the 13″ frame height, wheels & handle, three-footed design, and low $149 price tag makes it one of the easiest purchases possible for a garage gym. Now I’m sure those of you who spent a small fortune converting a Rogue Monster frame for the Thompson Fat Pad are completely content with your bench situation, and that’s great. I myself have a custom-chopped Monster frame and I don’t regret buying it at all because, at the time, that was the only real way to get a 17″-18″ high Thompson-equipped bench. That said, my Thompson Fat Pad is permanently installed on my Rep FB-5000 frame, and the narrower Rep pad is installed on my Monster Utility Bench (and is used as a secondary bench.) The Rep/Thompson combo is the perfect height, easy to move around, and I don’t have to worry about the massive rubber feet getting in the way of my feet. I love it. At the end of the day, the FB-5000 is the easiest 5-star product I think I have ever reviewed. 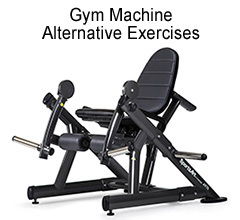 I highly recommend it for your gym – any kind of gym. The Rep Fitness thick/grippy pad is on backwards in pictures of the FB-5000 bench. Thanks for posting the comment about the correct facing of the pad. Otherwise I wouldn’t have noticed to do that! 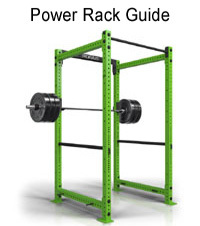 When are you doing a review of the PR-5000 power rack, also from rep fitness? I am working on a different rack review at the moment. Once I wrap that one up and recover some space I can start dealing with the next rack review, which in all honesty probably would be the Rep PR5k. I really need this bench to replace my 15 year old adjustable York bench (10” wide). I missed out on the last round and now I know I need to jump on it as soon as it’s available. The wider pad for this bench has since been listed as available, and in stock for $50 plus shipping. No apparent option to just have the pad replaced prior to shipping if in combination with the bench order. Yes looks like the 12″ pad is packaged with the frame still. Until they start to package the frame alone (assuming that they ever do) I think the fatter pad will continue to be an upgrade option. Price is solid though – no complaints there. Not sure if my comment went through, I’ll repeat it, just in case. 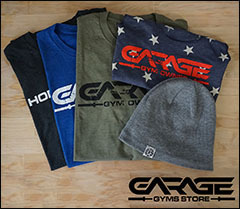 Can rep wide pad be put on rogue flat utility bench? 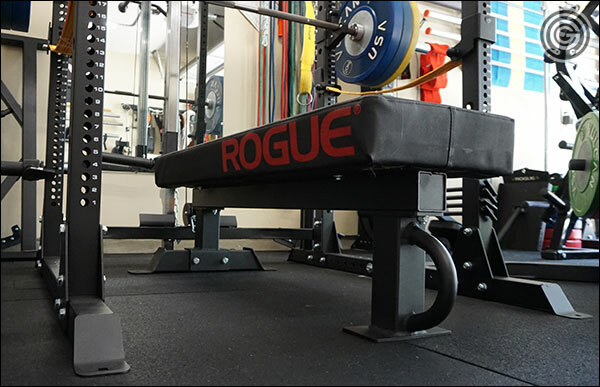 Yes, Rep’s new pads are completely compatible with Rogue’s hole pattern on their flat benches (both Utility and Monster). All of the Rep and Rogue “fat” pads are interchangeable. Thanks, great review and helped me finalize my purchase. Got the bench about a month ago and really liking it. I had to straighten out the front foot though as it had a slight bend and was causing the bench to wobble (was really only an issue when I was near the front of the bench). I had that problem with the FID version, but was easily fixed. Would be a nice touch for them to start putting rubber feet on their benches. I received the FB-5000 last week. They have changed the foot design and made the footprint smaller. 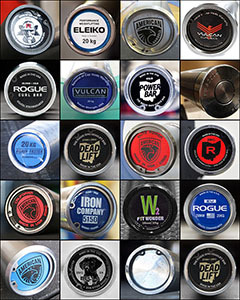 Did you have any wobble issue when picking up dumbbells with yours? No issues. What exactly did they change? The front foot has a rubber pad and only 4.5” across. The back one no longer has the flare and has rubber on it. Interesting. I wasn’t under the impression that the FB-5000 needed any refinement. I suppose I can see how those without rubber flooring may not like the flat, steel feet, but adding rubber feet shouldn’t make the bench any less stable on rubber flooring unless that was half-assed. Is yours actually wobbling? Only when I pickup dumbbells from the side. Oh while you’re sitting at the front of the bench, I assume. I have a Legend bench with tripod frame and when I have the bench in full incline for military presses, that happens as well. It’s just because all the weight is at the front of the bench on a single leg, so when your weight shifts to one side (especially with the added weight of a dumbbell), the rear legs can’t do much to help with stabilization. If it’s not happening at any other time then there isn’t anything wrong with the feet. You’d feel it rocking all the time, even when say bench pressing with the bar rather than dumbbells.